With current and former Gor Mahia players forming half the team, Harambee Stars registered their first win of the 2017 Africa Nations cup qualifiers when they beat Congo-Brazza at Kasarani on Sunday. In action were current Gor Mahia players captain Musa Mohamed, Boniface Oluoch, Francis Kahata and Eric Ouma. While former Kogalo players Anthony Akumu, David Owino Calabar and Michael Olunga also featured. Eric Johanna struck a second half winner as Harambee Stars rallied from behind to beat visiting Republic of Congo 2-1 in a thrilling Africa Cup of Nations qualifier at the Safaricom Stadium, Kasarani on Sunday. The visitors, playing in all white, took the lead courtesy of Prince Oniangue’s controversial penalty in the 20th minute before Ayub Timbe levelled the scores with a well taken volley just four minutes later. 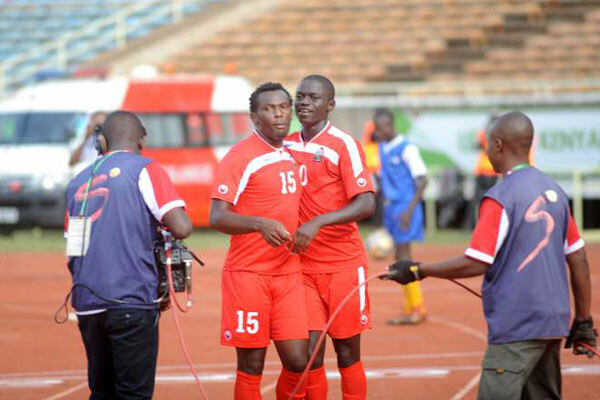 Stars started strongly with Johanna, captain Victor Wanyama and Ismail Gonzalez all making statements of intent early in the game but it is the visitors who drew first blood after Gonzalez was punished for a foul inside the box which Oniangue stepped forward and sent Boniface Oluoch the wrong way for the opener. Stars pushed hard for the equaliser and their efforts were soon rewarded after Timbe pounced on a long drop ball from Oluoch to drill home with a powerful volley. The Kenyans upped the tempo in midfield with Wanyama, Francis Kahata and Gonzalez dictating play but the Red Devils had another close chance of taking the lead with Dikamona Clevio rattling the bar just eight minutes before half time. Under-pressure Harambee Stars coach Stanley Okumbi made his first tactical change in the 54th minute, bringing in experienced defending midfielder Anthony Akumu for Gonzalez – who received a warm applause from the spectators as he walked off the pitch. With the home crowd anxious for a win, Wanyama picked the ball in midfield before releasing Johanna with a clever ball and the Mathare United man outsprinted his marker and looped the ball past Congo goalkeeper Christopher Mafoumbi with 22 minutes to the final whistle to give coach Okumbi his maiden win. Great.Anyone with info here;Are we getting Johanna Erick?Any progress?.Marcelo Erick was great today. last time we played this guy kwao the goal came from the left side,aki this boy marcello is gem he made sure no crosses came fromthe left am happy that at least the koroboi flickered,but only because of individual brilliance kulikuwa na ‘ patia serenkuma tactic’nyingi tu sana. Has Mighty Gor Mahia set another world record? How many clubs in the world have had their players scoring more than 3 goals for 2 different national teams on the same day. Jacques “Jausenge” Tuyisenge hit 2 for Rwanda & Khalid Aucho netted 1 for Uganda. Admin and anyone who can please research this might just be guiness book of records material! You forgot to add Abondo. The game ended with eight current and former Gor Mahia players on the pitch. Bottom line? Gor Mahia is the team for players who want to shine and be noticed. Chances for a deal abroad and selection for national team are higher. 90% of players who have secured transfers abroad from the KPL in the last three seasons are from Gor Mahia. Kahata and Johanna were superb. @Ja Asego kindly confirm for me if Johanna’s contract at Mathare expires in 6 months as reported. If so, sign a pre-contract with him to join in January under the Bosman rules since Munro is unwilling to sell now. @Musymo, If the contract ends in under six months then the player is at liberty to by off the remaining months. Remember Calabar and Teddy left under the same clause. So, in case Johana is interested then we/he can buy off the remaining months. How about Mieno? We seriously need him and release/sell Aucho as soon as possible so that the players can gell. I hear Kagere might join Tusker but the problem is that Tusker are not allowed to part with the kind of finance he is/was requesting. @Dan, If Aucho’s move does not materialize and he remains with us do you think we will need another midfielder? If he goes we need a top class replacement either of his level or better. In Mieno’s case I hear Tusker are not selling. There was talk by @Ja Asego of another Burundian but the foreign quota rule will pose a problem. As for Kagere , I wished we got him ahead of the Brazilian but the coach knows best and i respect his decision in the meantime, will wait and see. I will ‘die’ if Kagere joins another KPL team. The problem with players who think they are stars and never want to listen to the voice of reason. …I feel for such players!! Could Mighty Gor Mahia have set a new Guiness World Record? Surely is there any football club in the world whose players have scored 3 or more goals in full FIFA international friendlies for 2 different national teams on the same day. Jacques “Jausenge” Tuyisenge 2 for Rwanda and Khalid Aucho 1 for Uganda. Clarity the way it is supposed to be peddled. @Ja’Asego thank you so much for your very honest updates. I have reason to believe that your updates are very reliable. This is in contrast with what we see from some members of EC. We are told that K’Ogalo is sweating on who to release between Aucho and Sibomana yet at the same time we see ‘Thigo’ ‘Dilemma’ clad in a K’Ogalo jersey immediately he lands on Kenyan soil. Next we here ‘The Dilemma’ has already started training with the team at Camp Toyoyo. What is which? Someone should confirm to us that Thigo Dilemma has replaced Khalid Aucho. It is painful to lose Khalid, but the sooner we are told the earlier we shall come to terms with it. Why delay the pain? How about Meddie Kagere? I had of talks with this talisman from even before the first half of this season reached halfway: mara he is training with us at Camp Toyoyo, mara one foreign player to be dropped; mara the deal is almost complete…….Just as recently as last week. Chairman AR was telling us that they are still in talks with Meddie. This must be the longest contractual negotiations ever. Anyway let us just be told the truth so that we accept and move on. Some in the EC should stop weighing our heads. hahaha. @Jakoyo is it to accommodate Gor (Thigo)? @ Barefoot…@ Charles…Originally b4 Rangers showed interest in signing aucho,one foreigner was to be released to create room for a Brazilian signing…Now with aucho’s imminent move the debate is whether to leave the rest of the foreigners or still release one & bring another box to box midfielder-a view am championing given the crucial role of that position at GM in recent years.The players to be dropped are Messrs:-Jacob Keli,Edmond Murai,Eric Ochieng,James Ogada with Jackson Saleh being fribted for sale as Ze Maria doesn’t like his ball handling technique…Note Agwanda was also earmarked for release but I said he can finish the season as an option in the attack incase of an injury to one of the two main strikers.Kagere was to come yes but dynamics have changed based on coaches identified areas for strengthening & foreign quota,unless we replace aucho with kagere & modify the midfield roles as he is a centre forward while aucho is a typical holding box to box midfielder. And yes we are professionalizing the entire TB at GM with both coaches being Brazilian and fitness trainers Italian,an assistant to Sandro Fantoni is coming on board,as regards Tom Ogweno is it in order to say Tich Orumo…or??//?? The national team played tacticaly & this was due to hardwork by players who resolved to get +ve results. Most of these players were from Gor Mahia fc which is now a profesional club where players fight for playing time. If 4 players came from Gor Mahia & another 4 R former gor mahia players, it means that in the last three yrs , Gor has produced very good players for the nation. Mathare also produced their best who did not disapoint. Erick ouma also cemented his position in the national team.